Avalon is a beautiful island filled with ancient legends and its immortal inhabitants – King Arthur and his mysterious sister Morgan le Fay. Take a journey to the lands of paradise and share their innumerable treasures! High-quality animation and epic musical themes will have you immersed in the world of the Knights of the Round Table completely! The maximum bet in the game is $100. To get into the swing of the game, take a virtual tour to its Museum, where you can play magic cards and stay in the black whatever the outcome, although the gain in this case is quite a modest one. If you stumble upon the King’s Crown, his Cup, Coat of Arms or a Jewel, take them as an incentive to further your investigation into the island. Should you want more substantial gains – look out for the Treasure Chest, the Castle or the Lady of the Lake. Wandering along the island, don’t be afraid to meet the Lady of the Lake – the scatter symbol giving you additional coins. More than that, le Fay will endow you with free spins where wins are multiplied from two to seven times! The Treasure Chest is a wild symbol supplementing winning combinations. If you see the Castle through the island’s thick mist, you see a wild symbol. It can supplement your combinations or, as a wild multiplier, increase your gains by two! On top of all that, the combination of Castle symbols brings you the highly-sought jackpot of the game! There is a risk game available for you to increase the money you’ve earned already. The gist of the game is this: try to guess at the club or colour of the magic card. If you are lucky enough, your risk is generously rewarded with real live cash. Avalon slot offers you a unique chance to seize the treasures of the ancient Celts. Don’t miss it! 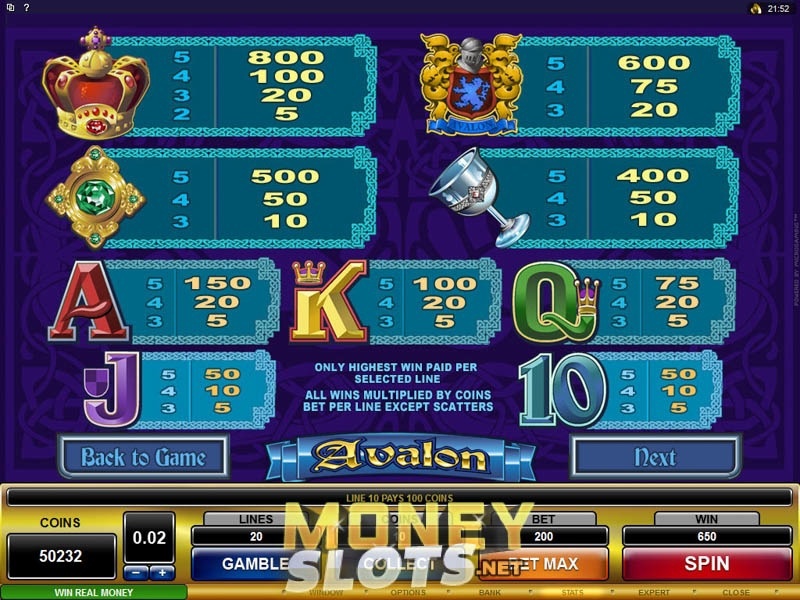 Available at Microgaming powered mobile platforms since 2012, this 5 reel 20 payline video slot enables simple game play on all the leading mobile devices and is home to a plethora of interesting symbols. Themed on the legend of King Arthur, the slot machine has King's crown, cup, coat or arms and jewel appearing on the reels among other icons. Avalon logo acts as a Wild symbol, while Lady of the Lake is Scatter and three or more of these award 12 free spins at up to x7 multiplier. Treasure chest substitutes for all other symbols during the free spin feature, while the gamble option can see you double or quadruple your line wins. Maximum coin jackpot stands at 3,000.